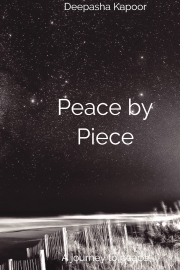 Description of "Peace by Piece"
Peace by piece is a collection of prose and poetry about overcoming hurt. This piece of art is divided into four sections depicting the whole process of growing as an individual. As everyone is entitled to happiness, everyone has to go through hurt and sadness as well. Without one, the other loses its significance and this is what the book talks about. The book follows a positive and magical outlook throughout the journey and invites the readers to leave with a peaceful and magical approach towards a wonderful gift that is life. Deepasha Kapoor is a young Indian author who weaves stories in form of poetries. She talks about everything from Magic to Soul and from Pain to Peace. Reviews of "Peace by Piece"
Some books you read for fun, some for inspiration but a great book such as this one is to feed your soul. I am not a reader of poems but when they are so relatable you just can't resist. Broken hearted? Motivated? Laidback? Or confusing thoughts are nagging you? This is one solution for all. You could see the journey that the author has gone through and the gem that has been created as a result. When these words come together they make a beautiful story. Being in love with someone and dreaming about small things to be achieved in our life.. Excellent content and book quality also amazing. Very beautifully written and more than perfect for a new author. The book has a beautiful meaning to it explaining our wonderfull gift “Life”. Highly recommended!! !